This spring, a remarkable relationship started between 2013 Women's Fund grantee Doctors Without Walls (DWW) and the Assistance League of Santa Barbara, thanks to Women's Fund member - and long time Assistance League member—Jane Atwater. When Jane learned that Doctors Without Walls needed pocket-sized hygiene products to give to their clients at the Women's Free Homeless Clinic, she offered the help of the Assistance League. Then she learned that the DWW clinic also provides lunch, showers, laundry and clothing to women who visit the clinic for medical care and that clinic volunteer Lisa Rader, N.P., had been going to garage sales, using her own money and her skills of persuasion to obtain clothing for the clinic. 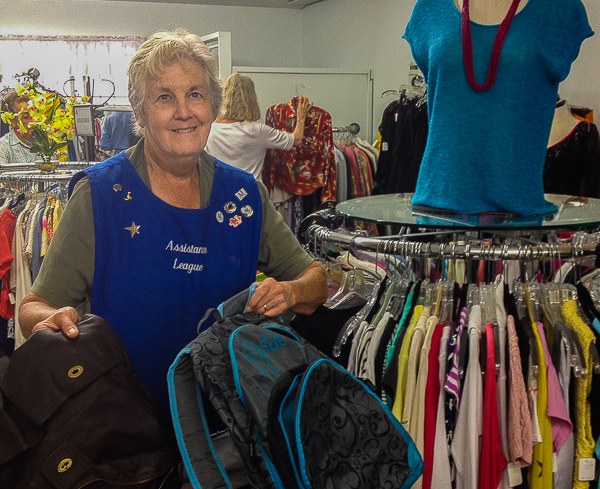 Jane proposed that the Assistance League could help with that too and now, once a month, the clinic receives free toiletries, clothing, sleeping bags and backpacks from the Assistance League's Thrift Shop. "Thanks to you, we see the women smile and gasp at the quality of clothes that you provide for them." Lisa told the Assistance League. "It gives them the opportunity to feel self confident, clean and better able to apply for jobs and housing."